This morning I got all wrapped up in my Silhouette cutting machine. This tool and I really get along well together. After a series of design errors I was able to make the following wall piece for my laundry room out of plain white card stock. Each of the four sections is made from two paper boxes designed to fit inside of each other. 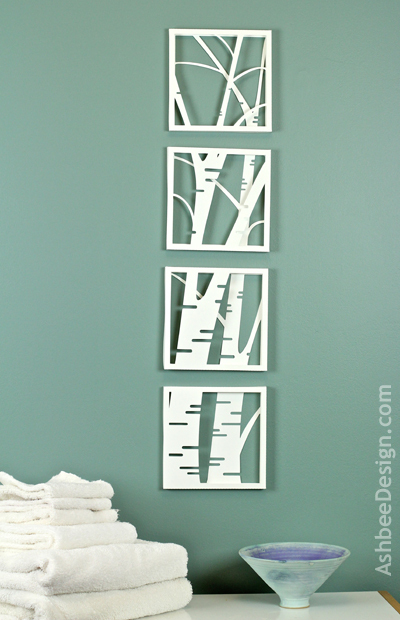 The silhouettes of two stylized birch trees are reflected in each of the four squares. The backs are left open to allow the wall color to show through. I am thrilled with its simplicity of design and its contemporary flair using a very traditional and rustic theme. This piece was inspired by various things I have previously pinned. I think it is appropriate to give credit to others that have inspired my creations. The first is the Christmas Paper Quilt designed by Patricia Zapata of A Little Hut. Her designs are beautiful, simple and graphic. I got the shadow box idea from her. She has patterns for this type of project for sale on her site. I combined that with the composition concept behind the birch wall constructions created by John Oman. I loved how the branches continued from one shadow box into the next. I opened up iDraw and created my own composition, splitting it into 4 boxes. Through a variety of technical gyrations I managed to create cutting files for my Silhouette and now have a completed wall piece. Even the black and white graphic plan is stunning! I just completed a new version of this techniques using a bamboo theme. Check it out here. This design is very straight forward. It could easily be accomplished with scissors! Go for it! Thanks for visiting and commenting. I love these. They're so effective. Can't beat silhouette and block colour. Yes, I am finding the Silhouette is quite an addition to my craft tools. Thanks for visiting and commenting. Zingzingtree? Great name! Gorgeous! I wish I had a Silhouette, if I did I would make something similar! Love it! Shannon, just try this type of thing using scissors. Some complex designs or very precise designs really require a Silhouette. This one doesn't. Thanks for stopping by and taking the time to comment. I m stunned by it, too. When I put it together I just stood back and said, Oh Wow! Thanks for the compliment! WOW this is so beautiful. I own a Silhouette but still having trouble to design my own things and cutting it. I made a lot of mistakes between the idea and completion of this project. It don't quite think in silhouette language yet but I am improving! I keep seeing your trees on linky parties and had to stop by to say how terrific they look! Thanks Julie. I have done quite a few different types of trees, haven't I. I love wood and branches and I guess that is translating through in this new tool. Thanks for taking the time to come on over and share. Gretchen, give it a try without the Silhouette, not that you shouldn't also consider the Silhouette. It has been a real inspirational tool for me. Thanks for visiting and commenting. amazing!!! I love this idea... you could do it with many other designs.... Beautiful! You really really amaze me with your silhouette skills! That is so cool! I would have never guessed that your project was just white card stock! You are one talented gal! Wow! I love how striking the blue is behind the outline! What a great idea! Wow so creative! I love that it is so different. Thanks for the inspiration! Lots of great comments this weekend. Thanks everyone for visiting and commenting. I am working on new designs using the same construction technique. Hope to have a new one out this week and eventually have the plans available. Simply beautiful in design and execution. Thanks Donna, I really am pleased with it. The Silhouette helped with the execution but I think it could be done well without. I really dig how modern the design is. Great combination of modern and rustic. Awesome job! Thanks Angela. I am extending the concept to other subject matters right now. Working on Bamboo. We'll see how that turns out. This is amazing! I love its simplicity and that it is made from paper. I just got my own silhouette and am trying to figure out what to do with it. If you get a chance I would love for you to come link up this project at my Tuesday Pin Party. Thanks for visiting and commenting Sarah. You'll find a variety of new ideas for your Silhouette on my blog. Off to visit your link party. Hello Sharon, Thanks for visiting and commenting. I've been enjoying Alderberry Hill recently as well. Linda, The concept of working in a series is a favorite of mine but this is the first time I've applied it to the Silhouette. Wish I had the patience to make something like this! It's so pretty. I adore birch trees. I just might have to try anyway. 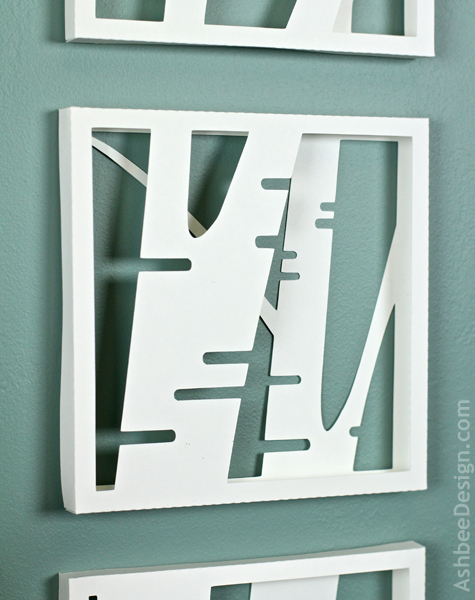 This project is deceptively easy, more so if you have a Silhouette, but even if cutting by hand. Give it a try. Start with just a 1-box shadow box. Even that can be effective with birch trees. Send pictures if you do! It is really stunning!!! I wish I had a Silhouette cutter. Doesn't require the cutter. It all can be done by hand with an x-acto knife! 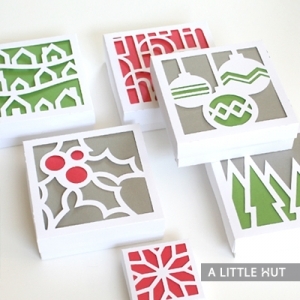 OMG i was shocked that this was cardstock and you used your Silhouette! I am in love with my Silhouette even more now. lol! Yup, I have a big package of plain white index card stock. I use it for first runs when designing but certain things just look better white. I have been doing a lot in plain white lately. I was there! Checking things out and linking again! Bamboo Shadow boxes coming your way! Wow - the design is so amazing!! Love how the blue of the wall pops through. Thanks for linking up at Romance on a dime!! Unfortunately I don't have a cutting machine (and can't justify purchasing one), so would have to do the work by hand. 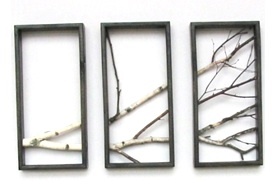 These remind me of the Anthropologie window from this past holiday season, as well as the real framed birch branches that I saw at an art show a couple of summers ago. Of my 3 shadow box designs the birch tree would be the most difficult to do by hand because of the round curves at the ends of the stylized lines. Change that element and they should be fairly easy to cut with and xacto blade. Give it a try and send photos! I didn't scroll far enough, and didn't see John Oman's work. He may be the artist that I saw. Spectacular pieces. Yes, I like John's work a lot and appreciate the inspiration. Thanks for visiting and commenting.